Capt. 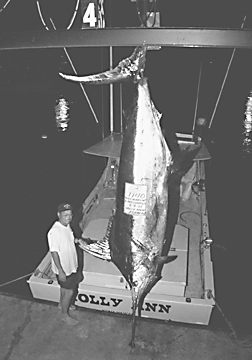 Kerwin Masunaga was alone on the HOLLY ANN when he hooked his 1140-lb Pacific blue marlin about 8 miles from Kona. He fought the fish for five hours before Teddy Hoogs came over on the PAMELA to help secure the fish. The marlin ate a jet lure.